Accommodation at The Priory consists of 18 bedrooms and 5 apartments, all with en-suite facilities. The rooms are fully carpeted and individually decorated and are available fully furnished. Residents may bring with them their own furniture and possessions to add their own personal touch to their surroundings. Each room is fitted with a nurse call system and a smoke detector. Telephone and television points are also available in all rooms should residents wish to use these facilities. Hospitality is very important at The Priory. We are particularly proud of our home cooking, using fresh seasonal produce wherever possible as well as home-grown vegetables and salads from our own garden, when available. We cater for a range of dietary requirements with an emphasis on traditional cooking for a balanced and nutritious diet. Visitors are always welcome and if residents wish to invite friends or relatives to join them for a meal, we simply ask for prior notice (a small charge is made for guests’ meals). Meals can be taken either in the dining room or in the resident’s own room if preferred. Refreshments, fresh fruit, biscuits and often home-made cakes, are available throughout the day for residents and guests. 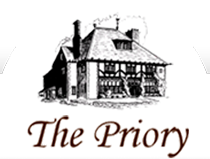 A relaxed, happy and informal atmosphere exists in The Priory. A regular programme of activities and entertainment takes place with the help of visitors and staff. Residents are encouraged to continue or create links with the local community and we help people to maintain their hobbies and interests. Recent events included musical entertainment, slide shows, coffee mornings as well as gentle exercise to music. We also organise seasonal events such as Christmas parties and summer fetes. Residents are always very welcome to invite friends and relatives to any of our entertainment. An excellent mobile library service is provided with normal and large print books, as well as tapes. Holy Communion takes place once a month for those who wish to receive it. Additionally, arrangements can be made for transport to local church services in Chippenham. The Priory is a non-smoking home.